Research has found that a large number of faces averaged using digital imaging algorithms appear more attractive to a broad range of people than most of the individual faces that made up the composite. This is the essence of the barrel averaging in whiskey production. Variations in different barrels can sometimes be better than average, sometimes worse - and sometimes just different. If you average 50 barrels then the results coalesce around a mean that is more broadly appealing that many of those casks were individually and bottle after bottle people have that consistent appealing experience. Barrel averaging has become a bit of a dirty word. Liquor stores are full of expressions where single barrel offerings are the more expensive upgrades to barrel averaged offerings and justly so. Barrel averaged offerings have the "warts and all" barrels mixed in. The single barrel offerings have been selected for decent flavor profiles by the distiller. But what if there are no other barrels to select from? No other barrels to average? That's the case of rare casks from closed distilleries and other private cask offerings. In that case you have to search long and hard for the really good casks. I ran headlong into this issue in my quest to sample some whiskey from the legendary long closed Islay distillery Port Ellen. It's not like I used to drink Port Ellen back in the day and now am jonesing for that long lost experience. I admit freely that my desire to drink it comes purely from absorbing the excitement I read in the whiskey blogs such as on Malt Madness. I kept nagging at the idea that Port Ellens are still around, but in a while they won't be and everyone thinks so highly of them... I just gotta... I just GOTTA! 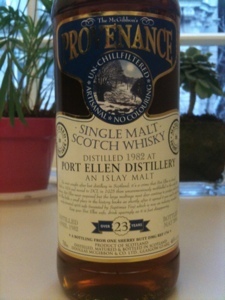 My local fancy store, Park Avenue Liquors offers 3 examples of Port Ellen to try. The distillery's own 9th edition 1979, universally lauded; the Douglas Liang 1983, and the Douglas McGibbon Provenance Port Ellen 1982-2005 23 year old expression. I purchased the latter because it was i) extremely dark in the bottle, ii) the lowest in cost (still $$$$ but a bit less than the others), and iii) it got a mostly decent B+ (and one A-) on the LA Whiskey Society site. Nose: Wow - an incredibly complex and not unpleasant melange of, first, peat, then sherry, smoke, kippers, toffee, lemon, and tobacco. There's also a clear phenol aspect, like mentholatum or maybe furniture polish. Entry is complex with sherry sweetness but also lemon tartness. Sweetness builds in midpalate which starts with sherry, then more sherry and even more sherry. Then I catch smoked fish, road tar, ash, and lemon. The phenol-menthol note shows up towards the finish. I guess it's not surprise that the finish is fairly long, if not particularly strong. It's bottled at 46% - I don't know if it's because the cask is down to that strength or if they dilute it (I suspect the latter). Nonetheless there's plenty of peat, and sherry wood tannins to drive the finish... and that phenol note... What the heck is that phenol note? All in all, I'm impressed - if not in love. It's clearly an Islay, but it has that interesting lemon flavor. My main issue is that sherry is such a dominant flavor note here. 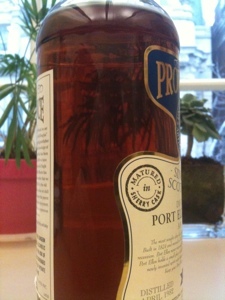 There are two circular medallions on the label that trumpet "Matured in Sherry Cask". No kidding. I'm kinda wishing it were just a regular bourbon cask because after nearly a quarter century the sherry cask has come to overshadow the Port Ellen qualities I was looking for. They are still there - but under a big wallop of sherry. On the other hand it was good sherry - and good Port Ellen flavors so I'm not really complaining. B+ it is. I do a 5 star rating system - so 4 stars. Update 10/24/12 (8 months later almost to the day): with air and time this bottle lost some of its furniture polish phenol and opened beautifully. It has become a staple shared dram for when serious whisky people visit and recently paired beautifully with chocolate. I have no hesitation giving this five stars now. It needed a few weeks of bottle oxidation to reach full lemon chamois glory. Wow I guess we're "serious whisky people", since the master of all things coopered (and totted) included this in our tasting! Go figure. We're having tee shirts and ID cards printed now. In all seriousness we've learned a lot from this blog, it's a rare wealth of information. And to get to taste this particular beasty was an amazing treat. We were less critical and more jaw-dropped (perhaps because it had already opened up in the bottle over time before we tried it), but this was a classic Islay experience. Like the best parts of what are now OB Lagavulin and Ardbeg with some beautiful sherry aging thrown in. A real treat with a piece of history thrown in.